► What was Samar doing when MacArthur waded ashore 60 years ago? 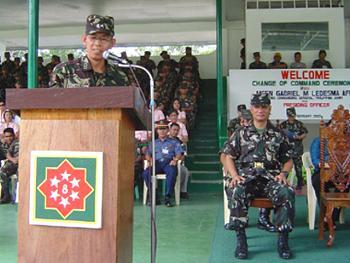 Assumption speech of Maj. Gen. Jovito S. Palparan Jr.
"Samar island is said to be the place where the communist terrorist will take their last stand..."
Let me begin my brief remarks today by expressing my heartfelt gratitude foremost to her Excellency President Gloria Macapagal-Arroyo for this designation as the 8th Infantry (storm trooper) Division commander, to our Chief of Staff AFP, General Efren L. Abu for his faith in me as a worthy successor to MGen Glenn J. Rabonza. I would also like to express my sincere appreciation to the army leadership represented here today by the guest of honor and speaker MGen Gabriel M. Ledesma, Acting Commanding General Philippine Army, for their trust and confidence in giving me this challenging job of commanding a division prominently engaged in security operation in this part of the country. Finally, after going through much controversies, they have arrived at a verdict. Now, as a division commander in Eastern Visayas, I look forward to facing the challenges of our government’s internal security operation besieging this region. Samar island is said to be the staging ground for the cadres of the communist terrorist movements before being deployed to other areas. It is also said that this is where the communist terrorist will take their last stand. Thus, I am faced with a challenge of addressing this problem by applying the resources available and at the same time having an open mind for others who may want to contribute in finding solutions towards lasting peace not only in this region but all over the country. Though we will zealously and wholeheartedly pursue our internal security operation objectives, we will still give peace a chance to flourish in the communities we serve. This of course, will not be possible without the understanding and support from local officials, church, other community leaders and the ordinary people in the streets and in the mountain areas. Together we endeavor to undertake renewed campaigns to reach out to our misguided brother Filipinos. To seek their return to their communities, live peaceful lives and become productive members of our society. But for those who resist to accept our hands of peace and continues the depredations and savage atrocities which have long hampered our economic growth and development these past three decades not to mention the lives lost, we vow to perform our constitutional and patriotic duty of serving and protecting our communities and people from such terrorists’ acts. Indeed we live in an interesting time and the task which lies ahead is full of challenges to hurdle. To the men and women of 8th Infantry (storm troopers) Division, I urge you to join me in this noble effort of bringing peace and stability in this region. Together, we will build upon and continue the work started by my predecessors. In return, I could only pledge to provide you with leadership and work with dedication and commitment. Well, I identify with that feeling. This situation has us sitting down, but in my heart, I’m still standing up, and I’m asking that each of you stand up with me. I challenge you to find a way to change things at every opportunity. As I see it, we’re all in this together. We’re at a decision point as a group and as individuals. We can sit and think, or we can band together and act. I prefer to act. How about you? As we begin together to meet the challenges and opportunities, let us call upon the almighty to bless our work and sacrifices. For apart from him we can do nothing. Finally, may I announce that all orders and instructions remain in effect until they are modified and/or rescinded. "...NPA terrorists are too lazy to work for a living and who would rather subsist like parasites on the produce of the needy, suffering masses." This year, the CPP/NPA/NDF members will be tasked to collect more money and goods or equipment for the movement. They will take advantage of the fear they are instilling to the populace in order to add more funds for their wicked cause. Business establishments and small entrepreneurs are being monitored by the NPA extortionists to strike at every opportunity and stash cash away from their hands. They extort money as their primary means to sustain their hopeless armed struggle. They consider themselves as modern heroes, capitalizing on the underdog mentality of the Filipino people to justify their existence. The people must understand that this is merely a myth. The people must not cooperate and refuse to be extorted. The CPP/NPA/NDF will have a heyday collecting millions this year without thinking that all businesses are suffering from the economic slump. Profit of business establishments are not expected to be high considering the economic situation. People are all hard-up, hardly making both ends meet and here comes the extortionists milking money from these poor people. And not only the rich owners of businesses are spared. Even the lowly farmer or barrio folk is deprived of a decent meal. Farm animals and tools are also targets of these extortionists. There have been consistent reports of extortion from the IRA of local government units, even from the barangay IRA, denying progress and development in the countryside. Our country would have marched to progress years ago. We lost 36 years of economic progress, compliments of the communists. These CPP extortionists must have the conscience not to deprive a peasant farmer’s family a kilo of rice or two pieces of eggs for the survival of NPA terrorists too lazy to work for a living and who would rather subsist like parasites on the produce of the needy, suffering masses. “Say no to these extortionists,” is the advise of Brig Gen Ramos, 8ID General Officer-in-Charge. The people, he said, have no obligation whatsoever to support terrorists like the NPAs. NOTE: I have been a member of the Circulo Hispano-Filipino, a group of Spanish-speaking Filipinos and Spanish speakers from around the globe who care about social, cultural, political, and economic developments in the Philippines, including the Philippines’ seemingly self-imposed isolation from Hispanic culture and language and the need to establish strong linkages with former Spanish colonies with whom we share many things in common. In this day and age when the Philippines faces seemingly insurmountable challenges, it is important that Filipinos learn to “think out of the box”, learn to look East and South for stronger economic, political, and cultural ties instead of simply “looking West”. If by looking West it means looking to Europe and especially America, it’s also time to look at “America” through a different set of lenses. For more than a century, we have always understood “America” to mean the United States, or simply, the “States”. This is an erroneous assertion, because Canada is also makes up the Americas; so do Mexico, Central and South America, and the Caribbean. Let us remember that, regardless of our righteous anger at the many excesses of Spanish colonial rule, Spanish language and culture nevertheless became part of our lives as a nation and as a people. In fact, our Declaration of Independence in 1898 was in Spanish, so was the Malolos Constitution that laid the foundations for the First Philippine Republic. It’s impossible to imagine an English-speaking Rizal, his works in Spanish, especially Mi Ultimo Adiós will always be part of our heritage. Many of our great nationalists, including Claro M. Recto, Lorenzo Tañada, and Jose W. Diokno could articulate the Filipino’s nationalist aspirations in Tagalog, English, and Spanish. It would be a mistake to dismiss or hate Spanish simply because it is a “colonial” language, the language of the oppressor – because English is also a colonial tongue. To make generalizations and exorcise Spanish as “the language of the oppressor” is to deny the fact that the Founders of our Republic also spoke the language. True, Spanish was the language of Padre Dámaso, but it was also the language of Simon Bolívar, Che Guevara, Camilo Tórres, Augusto César Sandino, and Jacobo Arbénz Guzmán. Spanish is also the language of Fidel Castro and Húgo Chávez – men who are hardly representative of the elite. Grácias, mi amigo Bernardino. Mi doble apellido es culpa de la máquina, o sea del Yahoo. Mi nombre completo es Adelbert Saborrido Batica, aunque si escribo yo como hispano, deberia ser Adelbert Batica Saborrido. Aí, el daño que nos hízo la colonización gringa. Bueno, el idioma filipino que uso en el mensaje es tagalo, uno que aprendí por la práctica. Continúo aprender mas castellano, lo cual continúo aprender desde mas de 40 años, aunque no estoy contento, como el proceso de aprender es un proceso perpétuo. Non scholae, sed vitae discimus! Como dijéron los Romanos. Y yo también - No estudiamos por la escuela, sino por la vida. English: Thank you, my friend Bernardino. My double family name is the machine’s fault, or better yet, Yahoo’s. My full name is Adelbert Saborrido Batica, although if I were to write like a Hispanic, it should be Adelbert Batica Saborrido. Oh, the damage that Yankee colonization did to us. Well, the Philippine language I use in the message is Tagalog, one that I learned through practice. I continue to learn Castilian, which I’ve been doing for more than 40 years, although I’m not satisfied because the learning process is a lifetime process. Non scholae, sed vitae discimus! The Romans used to say. And I too (say so) - We don’t study for school, but for life. Amigo Batica Batica, grácias por tu mensaje bien elaborado tanto en idioma castellano como en el otro que creo debe ser uno de los idiomas Filipinos. Ojalá todos los mensajes llegaran así, otro gallo cantaría para la ayuda a nuestra campaña pro rehispanizar y revitalizar la cultura hispana en FILIPINAS y además poner el conocimiento de ese pueblo tan querido los problemas de los demás países hispanos hermanos, que son muy comúnes a los suyos. Ya que Filipinas sufre un bloquéo tan importante como el que destacas en tu mensaje sobre Cuba. Hemos de ayudar a hacerles ver a los filipinos y a todos los demás pueblos subyugados por la globalización, tanto en la zona hispánica como en otras que también ocurre. English: My friend Batica Batica, thank you for your well-articulated message both in the Castilian language as in the other, which has to be one of the Philippine languages. Would that all messages would reach (me) in a similar manner (bilingual), another rooster who might be singing for help in this (our) campaign to re-hispanicize and revitalize Hispanic culture in the Philippines and further make this beloved country aware of the problems of other brother Hispanic countries who share similar problems with you. The fact is, the Philippines is also suffering from a blockade, like the one you discussed in your message about Cuba. We have to help Filipinos as well as other peoples subjugated by globalization see (the reality), be it in Hispanic areas or in others where it’s also happening. Mabuhay kayo, Don Guillermo! Diyan ako hanga sa inyo, kung banat anti-imperialista na ang pag-uusapan. Napakatumpak at karapat-dapat lamang na tayo'y maki-isa at maki-balikat sa ating mga kapatid sa LatinoAmerica at iba't ibang panig ng mundong wikang kastila. Hindi kataka-taka na tayong lahat ay dapat maligalig sa mga nangyayari sa Filipinas at sa LatinoAmerica, dahil para yatang tayong mga Filipino at mga LatinoAmericano ay niluluto sa isang palayok na ginagatungan nga IMF, World Bank, WTO, at ng mismong gobierno ng Estados Unidos. Hindi natin maipagkakaila na ang mga naturang bansa, katulad ng Filipinas nating mahal, ay lubog na sa utang at patuloy na sumusunod sa mga nireresetang "gamot" ng IMF - upang tuluyang mangutang at ang kani-kanilang mga economia ay patuloy na nakatali sa mga dicta at capricho ng World Bank-IMF con WTO pa gani. Kawawang Filipinas at kawawang LatinoAmerica. Ngunit mas lalong kawawa ang Filipinas, dahil hindi lamang walang pera, walang pagkain, walang tubig, walang ilaw ang bansa, kundi ang mga lideres ay napaka-walang hiya. Que viva Vd. Don Guillermo! Cuando se hábla de ponencias anti-imperialistas, ahí le admiro. Es justo y correcto que nosotros filipinos nos unémos por nuestros hermanos en LatinoAmerica y en otras partes del mundo hispano-hablante. No es sorprendiente que nos molestan mucho lo que están pasando en las Filipinas y en LatinoAmerica, como nos están cocinando a nosotros en la misma jolla El IMF, Banco Mundial, WTO, y las pólizas del gobierno de los EE.UU. No podemos negar el hecho que nuestros países, nuestra querida Filipinas que esta ahogando en deudas y continúan tomar la medicación recetada por el IMF, para que continuarían conseguir préstamos al mismo tiempo que sus propias economías estén atadas por las dictas y caprichos del Banco Mundial-IMF, y también del WTO. Pobre Filipinas y pobre LatinoAmerica. Pero Filipinas se encuentra en una condición mas miserable, no sólo que no hay dinero, ni comida, ni agua, ni luz, sino también tiene líderes sin vergüenza. Iba naman ang kalagayan ng Cuba, patuloy na naninindigan bagama't unti-unting sinasakal ng bloqueo economico na sinimulan ng Estados Unidos noong pang 1960. Kung matatandaan pa natin, noong taong iyon - sa halip na ang Cuba ay bumili ng crudo galing sa Estados Unidos, bumili ng crudo galing sa Venezuela. Kaya lang, ang nagmamay-ari noon ng mga refinería ay mga companiyang Kano at Ingles, at tumanggi sila sa crudong Venezolano. Ang pobreng Fidel ay napilitang sakupin at angkinin ang mga refineriang dayuhan, at sakupin din ang mga lupang pag-aari ng mga companiyang dayuhan. Doon na gumanti ang gigante sa hilaga, sa pamamagitan ng bloqueo economico. Ako po'y humihingi ng paumanhin sa mga kasapi sa circulong ito, kung halimbawa'y hindi ko maiwasan ang pagbanat laban sa mga patakaran ng Estados Unidos, lalo na iyong nauukol sa Filipinas. Mahirap para sa isang Filipino tulad ko, na pag-usapan ang hispanismo sa Filipinas at ang pakikipag-ugnay sa mga bansang hispano-hablante, lalo na ang LatinoAmerica, at hindi isasangkot ang Estados Unidos, dahil naman - gustuhin ko man o hindi, andoon din at buhay na buhay ang mga patakarang hindi makatarungan ng EE.UU. La situación de Cuba es algo diferente, continúa ponerse de pie a pesar de estar sofocado, poco a poco, por un bloqueo económico forzado por los EE.UU. desde el año 1960. Si todavía nos recordamos, Cuba, en vez de comprar el crudo de los EE.UU., lo compró de Venezuela. El problema era que, las refinerías en Cuba pertenecieron a las compañías gringas y ingleses, y por consiguiente rehusaron procesar el petróleo venezolano. El pobre Fidel decidió entonces nacionalizar y confiscar las refinerías extranjeras. Y luego el gigante del norte se desquitó, por un bloqueo económico. Yo pido la disculpa de mis contertulios en este círculo, si acaso no pueda yo evitar de mis protestas contra las pólizas de los EE.UU., especialmente los que se relacionan con las Filipinas. Es algo difícil para un filipino como yo, discutir sobre el hispanismo en las filipinas y tratar de hacer intercambios con el mundo hispano-hablante, específicamente con LatinoAmerica, sin incluir a los EE.UU., porque allí están las pólizas injustas de los EE.UU., vi vito y coleando, que quiera yo o no. Ngunit sa kabila ng bloqueo laban sa Cuba, oo nga't naghihirap ang mamamayang cubano, nguni't ang nakapagtataka ay buong-buo ang kanilang isip, at ang paghihirap doon ay hindi naman tulad ng paghihirap ng maraming mamamayang Filipino, na halos mamatay na sa gutom. Oo nga't democracia "kuno" ang gobierno natin sa Filipinas, nguni't ang nakakahiya ay - mas marami ang nagugutom, mas marami ang maysakit, mas laganap ang kurakot, mas mabaho at matindi ang amoy ng ihi at basura sa Maynila (habang malinis ang Habana at iba't iba pang panig ng Cuba walang amoy ng ihi o ng basura). At kung larangan naman ng educacion ang pag-uusapan natin, libre ang pag-aaral sa Cuba (hanggang universitaria), masigasig ang pagtuturo ng cultura, ciencia, at tecnología, y los lenguajes. Kung pangkalahatang kalusugan naman ang pag-uusapan - lahat ng mamamayang cubano ay nakikinabang dito. Oo, simple lang ang kanilang mga servicio, kaya lang - malayo talaga ang sistema ng salud publica sa Filipinas. Ano'ng nangyayari? A pesar del bloqueo económico contra Cuba, a pesar del sufrimiento del pueblo cubano, lo que me sorprende mucho es que la gente tiene el ánimo y la determinación, y el sufrimiento del pueblo cubano no llega al nivel del sufrimiento de la mayoría de los filipinos, quienes ahora se parecen que están muriendo de hambre. Sí, que las Filipinas tiene un sistema de gobierno democrático o algo así, pero lo que me da vergüenza es el hecho que hay mucho más que sufren del hambre, hay mucho más enfermos, la corrupción es mas prevaleciente, hay mucho mas olor de la orina y la basura en Manila (mientras que en las calles de la Habana y otras partes de Cuba no habían el olor de la orina ni la basura). Tanto a la educación, esto es libre desde la primaria hasta la universitaria, se enseña con todo ánimo la cultura, la ciencia, tecnología, y los lenguajes. Tanto a la salud universal, todos los ciudadanos cubanos son beneficiarios y aprovechan de esto. Sí, ellos aprovechan de servicios simples, pero la verdad es que la salud publica de Filipinas, un país democrática, es demasiado lejos de lo de Cuba - un país comunista. ¿Qué pasa? Hindi naman sa ipinagtatanggol ko ang sistemang comunista o socialista, hindi sa ako'y tagahanga ng sistemang cubano (dahil marami ring mga bagay doon na hindi ko nagugustuhan). Ang sa akin ay nagtataka lamang - kung bakit itong democracia natin sa Filipinas ay hindi lamang mahina, kundi mas nagpapahirap sa sangkapilipinuhan, sa halip na sila ay iangat sa kahirapan. At ang pinakamasakit pa dito - itong democracia natin ay copia pa nga democracia ng Estados Unidos, mas malapit pa tayo sa EE.UU., nguni't itong ating pagiging malapit sa mga "kabutihan" at "gracia" ni Tio Sam, ay hindi naman napakikinabangan ng nakararaming Filipino. Kaya, kung talagang totoong nakakabuti sa karamihan ang sistemang democrática, bakit mas matindi pa ngayon ang paghihirap ng mamamayang Filipino? No quiero decir que defiendo el sistema comunista o socialista, y no significa que yo admiro el sistema cubano (porque hay muchas cosas en Cuba que no estoy de acuerdo). Lo del mío es un estado de estar sorprendido - por qué la democracia de Filipinas no sólo es incapaz, sino también hace sufrir a los filipinos, en vez de rescatarles de la pobreza. Y lo que me da tanta pena es que nuestra democracia es una copia de lo de los EE.UU., tenemos relaciones mas cercas con los EE.UU., pero el estar cerca a los "bienes" y a la "gracia" del Tio Sam no da provecho a la mayoría de los filipinos. Entonces, si es verdad que el sistema democrático es para el bienestar de la mayoría, ¿por qué el pueblo filipino ha sufrido mas en este momento bajo este sistema democrático? Ang aking mga kuro-kuro ukol sa Cuba ay nahagilap ko sa pamamagitan ng isang maikling pagdalaw sa Lupa ni Fidel, maikli dahil dalawang linggo lamang ako doon, ngunit sa loob ng dalawang linggong iyon, sa pamamagitan sa pakikipag-ugnay sa mga ordinariong cubano (at iilang maituturing nating "middleclass"), mas naliwanagan ako sa tunay na kalagayan sa Cuba. At kahit naman saan ako nagpunta (Habana, Pinar del Río, Vinales, Trinidad, Santa Clara), ang mga salitang nangingibabaw ay: el bloqueo economico. Totoong ang kalagayan ng Cuba ay dapat mabigyan ng lunas, ngunit ang suliraning iton ay dapat pag-usap-usapan ng cubano na mismo - ya que sila'y nasa Miami o sa Cuba. Ito'y suliraning cubano, tulad ng kalagayan ngayon sa Venezuela ay isang talakayin ng mga venezolano. Kahit ano pa man ang mangyari, tayo namang mga kapatid at mga kaibigang Filipino ay dapat maki-isa at makibalikat sa kanila, at igalang ang kanilang pagsasarili. Sa Cuba naman, ang ipagdarasal ko lamang, ay hindi sana bumalik ang panahon ng demoniong si Batista, ang pagbubugaw, hindi lamang ng kababaihan, kundi ng dangal at kaluluwa ng Cuba. Yo recogé mis opiniónes personáles sobre Cuba déntro de una visita corta a la tierra de Fidel, digo corta como llevé solo dos semanas en el país, sin embargo, dentro las dos semanas, logré una imagen mas clara del país y de la condición actual, por mis intercambios con gente cubana ordinaria (y con algunos de la media clase). Y dondequiera que me fui (a la Habana, Pinar del Río, Viñales, Trinidad, Santa Clara) la frase que subía era el bloqueo económico. Verdad que la situación de Cuba necesita una solución, pero este asunto debe discutirse por los cubanos mismos, y no importa si ellos son los cubanos de Miami o los que viven en Cuba. Es un asunto cubano, tal como lo de Venezuela es un asunto venezolano. Y sea lo que sea, nosotros - sus hermanos y amigos filipinos debemos unirnos y cerrar filas por ellos, al mismo tiempo que respetamos su propia soberanía. Tanto a Cuba, lo que ruego yo es que no regrese nunca el tiempo del demonio Batista, la prostitución no sólo de las mujeres, sino también lo del honor y del alma de Cuba. Mabuhay ang Venezuela, mabuhay ang Cuba, mabuhay ang LatinoAmerica! ¡Que viva Venezuela, viva Cuba, viva LatinoAmerica! ¡Que viva la Solidaridad! Creo, sin equivocarme, que todos debemos cerrar filas por pueblos hermanos de habla castellana como Venezuela independiente de sus intestinas cuestiones políticas. En cuanto al caso de Cuba, no hace falta ser comunista para ver que ese bloqueo económico que se le hace, no es justo. Será muy interesante ver qué es lo que va a pasar en Cuba en el momento que el Presidente Fidel Castro se retire del poder y que toda la infraestructura de resistencia constante y apasionada contra el WASP usense se desmorone. ¿Se volverá Cuba tan prostituida, tan fastidiada, tan empobrecida, tan corrompida , tan falto de atención médica para todos, tan hambrienta a pesar de "la democracia", y tan pisoteada por prostituida como lo está ahora Filipinas? EN FIN CERREMOS FILAS por el bien de Venezuela y de todos los venezolanos. Cerremos filas por TODOS nuestros países, los países de lengua y cultura hispanas...Hagamoslo igualmente por TODOS los cubanos irrespectivo de la desunión que ahora padecen, deseando que esa misma desunión entre los de Miami y los de la Isla desaparezca a la postre para que resurja una CUBA aun más grande y aun más fuerte. I believe, without a doubt, that all of us have to close ranks behind brother countries of the Spanish-speaking world like Venezuela, regardless of their internal political issues. As far as Cuba, it doesn’t take a communist to see that the economic embargo against it is unjust. It will be very interesting to see what is going to happen in Cuba once President Fidel Castro retires and the infrastructure for strong and passionate resistance against the White, Anglo-Saxon Protestant (WASP) U.S. crumbles. Will Cuba go back to being so prostituted, abused, impoverished, corrupted, so deprived of medical care for all, so starved in spite of the “democracy” just like (the democracy) that has burdened and is prostituted in the Philippines? Finally, let us close ranks for the good of Venezuela and of all Venezuelans. Let us close ranks behind ALL our countries, countries of the Spanish language and culture… Let us do the same for Cuba, regardless of the apparent disunity among those in Miami and those on the island, hoping only that such disunity may disappear and that a greater and stronger Cuba may emerge.